This assay has high sensitivity and excellent specificity for detection of RAGE. No significant cross-reactivity or interference between RAGE and analogues was observed. NOTE: Limited by current skills and knowledge, it is impossible for us to complete the cross-reactivity detection between RAGE and all the analogues, therefore, cross reaction may still exist in some cases. Small volumes of AGER elisa kit vial(s) may occasionally become entrapped in the seal of the product vial during shipment and storage. If necessary, briefly centrifuge the vial on a tabletop centrifuge to dislodge any liquid in the container`s cap. Certain products may require to ship with dry ice and additional dry ice fee may apply. MBS724049 is a ready-to-use microwell, strip plate ELISA (enzyme-linked immunosorbent assay) Kit for analyzing the presence of the Advanced Glycosylation End Product Specific Receptor (AGER) ELISA Kit target analytes in biological samples. The concentration gradients of the kit standards or positive controls render a theoretical kit detection range in biological research samples containing AGER. The ELISA analytical biochemical technique of the MBS724049 kit is based on AGER antibody-AGER antigen interactions (immunosorbency) and an HRP colorimetric detection system to detect AGER antigen targets in samples. The ELISA Kit is designed to detect native, not recombinant, AGER. Appropriate sample types may include undiluted body fluids and/or tissue homogenates, secretions. Quality control assays assessing reproducibility identified the intra-assay CV (%) and inter-assay CV(%). Intended Uses: This RAGE ELISA kit is a 1.5 hour solid-phase ELISA designed for the quantitative determination of Human RAGE. This ELISA kit for research use only, not for therapeutic or diagnostic applications! Principle of the Assay: RAGE ELISA kit applies the quantitative sandwich enzyme immunoassay technique. The microtiter plate has been pre-coated with a monoclonal antibody specific for RAGE. Standards or samples are then added to the microtiter plate wells and RAGE if present, will bind to the antibody pre-coated wells. In order to quantitatively determine the amount of RAGE present in the sample, a standardized preparation of horseradish peroxidase (HRP)-conjugated polyclonal antibody, specific for RAGE are added to each well to "sandwich" the RAGE immobilized on the plate. The microtiter plate undergoes incubation, and then the wells are thoroughly washed to remove all unbound components. Next, substrate solutions are added to each well. The enzyme (HRP) and substrate are allowed to react over a short incubation period. Only those wells that contain RAGE and enzyme-conjugated antibody will exhibit a change in color. The enzyme-substrate reaction is terminated by addition of a sulphuric acid solution and the color change is measured spectrophotometrically at a wavelength of 450 nm. A standard curve is plotted relating the intensity of the color (O.D.) to the concentration of standards. 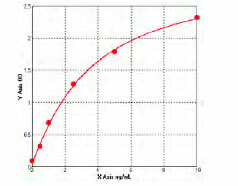 The RAGE concentration in each sample is interpolated from this standard curve. NCBI/Uniprot data below describe general gene information for AGER. It may not necessarily be applicable to this product. RAGE: Mediates interactions of advanced glycosylation end products (AGE). These are nonenzymatically glycosylated proteins which accumulate in vascular tissue in aging and at an accelerated rate in diabetes. Acts as a mediator of both acute and chronic vascular inflammation in conditions such as atherosclerosis and in particular as a complication of diabetes. AGE/RAGE signaling plays an important role in regulating the production/expression of TNF- alpha, oxidative stress, and endothelial dysfunction in type 2 diabetes. Interaction with S100A12 on endothelium, mononuclear phagocytes, and lymphocytes triggers cellular activation, with generation of key proinflammatory mediators. Interaction with S100B after myocardial infarction may play a role in myocyte apoptosis by activating ERK1/2 and p53/TP53 signaling. Receptor for amyloid beta peptide. Contributes to the translocation of amyloid-beta peptide (ABPP) across the cell membrane from the extracellular to the intracellular space in cortical neurons. ABPP-initiated RAGE signaling, especially stimulation of p38 mitogen-activated protein kinase (MAPK), has the capacity to drive a transport system delivering ABPP as a complex with RAGE to the intraneuronal space. Interacts with S100B, S100A1 and APP. Interacts with S100A12. Endothelial cells. 4 isoforms of the human protein are produced by alternative splicing. 1. S100A13 interacts with the C2 domain of RAGE.